Petroleum process engineers looking for a precise, reliable, compact flow measurement solution for deepwater module applications, will find the V-Cone® Subsea flow meter from McCrometer offers superior accuracy and repeatability in a highly compact, no-moving parts instrument that requires virtually no recalibration or maintenance over an exceptionally long life. With oil/gas in short supply, the need for subsea oil and gas production continues to grow in marginal fields once thought to be un-economical. Locating production modules thousands of feet below the sea, presents a highly rigorous operating environment for flow measurement instrumentation. McCrometer's V-Cone Subsea flow meter is ideal for the subsea production environment. It relies on an advanced differential pressure flow sensor designed with built-in flow conditioning to achieve an accuracy of 0.5%, with a repeatability of 0.1%. It operates over a flow range of 10:1, and comes in line sizes from 0.5 to 120 inches. With its unique ability to self-condition flow, the V-Cone Subsea flow meter is a real space-saver, eliminating the need for long up/down stream straight pipe runs required by other DP technologies, such as orifice plates and venturi tubes. It can be installed virtually anywhere in a piping system or be easily retrofit into an existing piping layout, providing installation flexibility and initial cost savings. Unlike traditional DP instruments such as orifice plates and venturi tubes, the V-Cone Subsea flow meter's design is inherently more accurate because the flow conditioning function is built-into the basic flow sensor design. The V-Cone conditions fluid flow to provide a stable flow profile that increases accuracy. 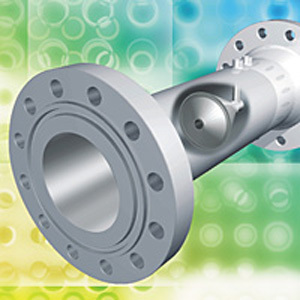 The flow meter's design features a centrally-located cone inside a tube. The cone interacts with the fluid flow and reshapes the velocity profile to create a lower pressure region immediately downstream. The pressure difference, which is exhibited between the static line pressure and the low pressure created downstream of the cone, can be measured via two pressure sensing taps. One tap is placed slightly upstream of the cone and the other is located in the downstream face of the cone itself. The pressure difference can then be incorporated into a derivation of the Bernoulli equation to determine the fluid flow rate. The cone's central position in the line optimizes the velocity of the liquid flow at the point of measurement. It forms very short vortices as the flow passes the cone. These short vortices create a low amplitude, high frequency signal for excellent signal stability. The result is a highly stable flow profile that is repeatable for continuously accurate measurement. All of this is possible with a minimal straight pipe run of 0 to 3 diameters upstream and 0 to 1 diameters downstream from the flow meter. The V-Cone Subsea flow meter's flow measurement technology has been employed successfully in the oil and gas industry and solves some of the toughest flow measurement problems including wet gas, condensate,and dirty or abrasive flows in off-shore installations. In addition to wet gas applications, other applications include gas lift, gas injection, leak detection, flare emission systems and more. McCrometer's advanced liquid, steam and gas flow measurement solutions solve complex challenges in Agriculture, Municipal/Industrial Water & Wastewater, Oil & Gas, Process Control & Plant, Electric Power Generation, and Institutional Facilities. The company's products and systems are found in thousands of installations worldwide. Its products and systems meet many of the world's most demanding industrial, safety and quality standards.